Wind instruments form the most varied musical family in Laos. They include the emblematic mouth organ khaen, but also the dadoula (a flute), the tchudu (a trumpet), and even simple leaves. 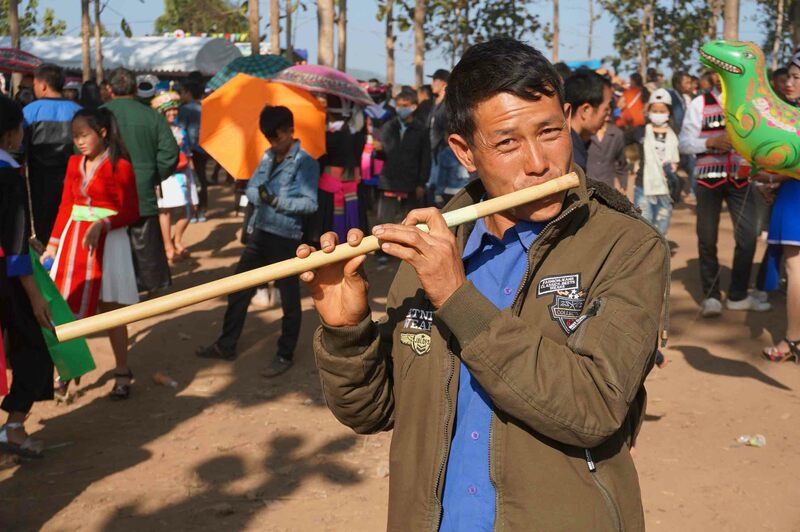 Wind instruments can mimic language, as is the case of the Hmong raj nplaim, or communicate across long distances, like the buffalo horn of the Akha. But the deceptively simple-looking instruments have generally been overlooked as an important part of Laos’ cultural heritage, until now. “Voices of the Wind: Traditional Instruments in Laos,” a new exhibition at the Traditional Arts and Ethnology Centre in Luang Prabang (TAEC), is the result of over two years of research and curation by Belgian ethnomusicologist, Dr. Marie-Pierre Lissoir, and TAEC. Dr. Lissoir performed her PhD research in remote Houaphan Province on Tai Dam khap singing, and returned to Laos to work for TAEC and further their research into music. 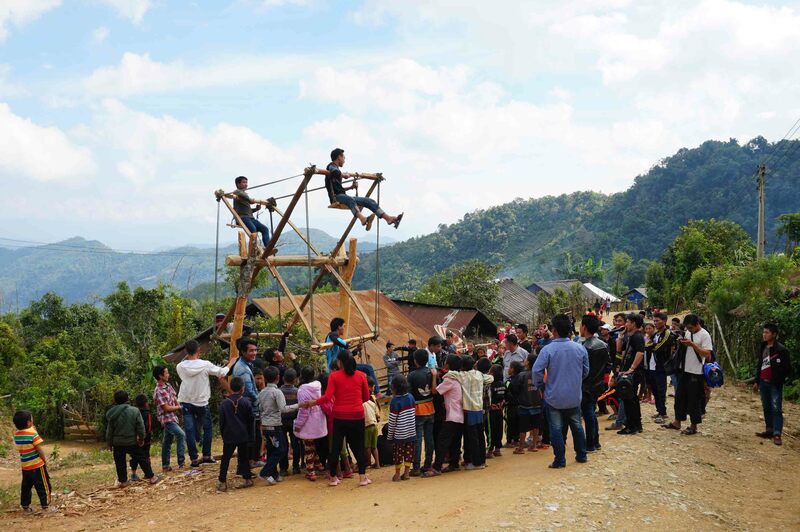 On their mission to document music across northern Laos, the TAEC research team participated in new year celebrations of several ethnic groups, including the Iu Mien, Lahu, and Oma, the latter of which includes the construction of a temporary wooden Ferris wheel! The new year begins in December or January for several ethnic minority groups of Laos, and is an important time of feasting, family, and games. Music is used for entertainment and dancing, though nowadays, DVD players hooked up to speakers are often more common than pipes and flutes. Fewer young people are learning to play traditional instruments, and in many communities, there is no one left who knows how to make or repair the instruments themselves. 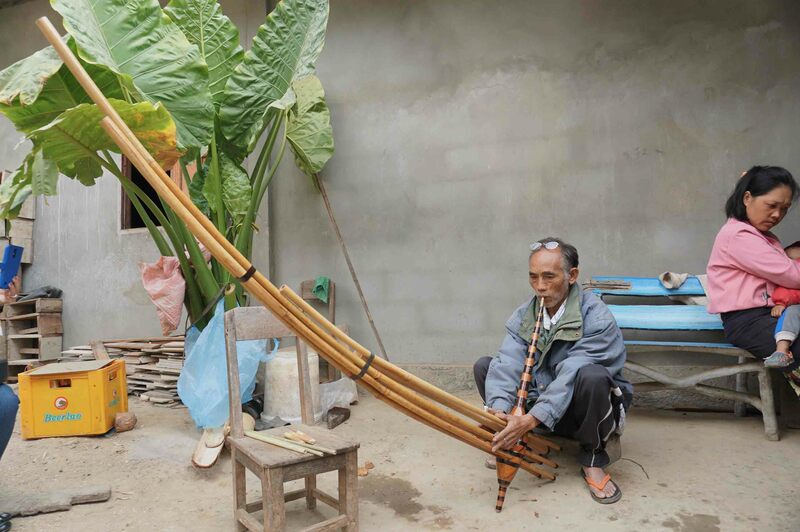 For example, in Ban Phoudonthan in Luang Namtha Province, the last resident who knew how to make the hao dong nou, a Mien flute, passed away a few months ago. “Voices of the Wind” features a musician playing a haunting melody on the village’s last hao dong nou. Music is the voice of a community, the voice of a country. To learn more, visit “Voices of the Wind: Traditional Instruments in Laos” at the Traditional Arts and Ethnology Centre in Luang Prabang. Interactive and intimate, the special exhibit features wind instruments and their role in communication, ritual, and courtship. Through recreations of a Hmong instrument-maker’s workshop, a Tai Dam healing ceremony, and interactive video kiosks, visitors can enter a world rarely seen by the general public.